I went diving once with a guy called Jeff. Nice Divemaster but the ravages of time had begun to affect him more than he liked. To deflect from his gray hair and increasing obesity he had a story he would tell divers before they went in with him. It happened a few years earlier when 4 British Army lads went with him to do a straightforward wall dive, but with a drop off to 200 metres. Before the dive they had teased him about how slow and fat he was and how they were at the peak of their fitness. "you'll slow us down" "you should give this game up and retire mate" they'd said. Jeff took them down to 30 metres, but one of them looked down for too long, got a dizzy spell which fast became a panic attack and then went to bolt for the surface. Jeff pinned him to the wall, the others floated and watched, and he slowly brought him up in a controlled ascent. Back on the shore they all quietly stowed their gear in a hired jeep and drove off back to their hotel. He never saw them again, despite it being the first dive of a 5 day package. "vertigo, that's what he had" said Jeff. But Jeff was wrong, all he had was a sensation of a fear of heights brought on by the long drop and then a panic attack. Vertigo is much worse than that, as if it had been Jeff would have been dragged up too. The point I am making here is that the common misconception that fear of heights and the resulting feeling being vertigo is wrong. Vertigo is where the brain cannot interpret vestibular signals from the inner ear balance centre. The inner ear is the third part of the whole ear organ system and lies beneath the middle ear which is the bit you have to equalize. Most often there is a mismatch between the signals from the left and right sides of this inner ear which the brain cannot interpret and then resulting in the classic symptoms of a feeling of rotation. This is either of your surroundings or yourself and believe me can be one of the most terrifying situations underwater. The main causes of vertigo can be divided up into 2 areas. Firstly, unequal stimulation of your vestibular apparatus, or the inner ear balance centres. And secondly, due to an unequal response of these balance centres to the same external stimulus. This is what happened to me on a dive in the Red Sea. I was nearing the end of a perfect dive, maximum visibility, huge Batfish schools and warm 3mm shortie sort of water. I ascended what must have been a couple of metres to go over a coral head when it hit me. With no warning everything in my field of vision started to rotate, and not just slowly, but at 100 rpm. On top of this I had a ringing in my ears, known as tinnitus coupled with a horrible feeling of nausea. Vomiting was not far off. I was experiencing one of the commoner causes of vertigo whilst diving, alterobaric vertigo or ABV for short. What happens here is that on ascent the middle ears don't clear the expanding air equally, the pressure across the inner ear is not equal and the poor old brain can't cope with the asymmetric messages. End result, vertigo. One study in Sweden has calculated this as probably causing over 60% of the cases of vertigo in all divers that experience this symptom. It also seems to be more frequent in experienced divers and perhaps the resulting disorientation and vomiting can explain some of the deaths in this group. Bolting to the surface will only make it worse as it increases the asymmetric pressure difference. The way to cope with this is to grab onto a rock, make that point your centre of your field of vision so the nausea is lessened as you look at a fixed non-rotating point. Then you must try to descend a little so the middle ear air compresses a bit and takes the pressure off your balance centre. Normally all will be fine in 30 seconds, but it can go on for up to 10 minutes. What I now do is tell any buddy I dive with that this could happen and not to try to drag me topside as this will only worsen it. Also try to figure a sign for ABV as waving your hand by your ear makes most people think you are having equalization problems and again they may try to take you up slowly, which will only worsen it. So this is an unequal response to a same stimulus. What of the other main cause, the unequal stimulus to each balance centre? Well here a common cause is what we call "transient vertigo due to differential caloric stimulation". It may sound complex but its really very straight forward. It's all in the temperature of the water entering your ears. If cold water enters one ear canal and not the other, then this can cause vertigo. The causes of this are wearing a poor fitting diving hood or even having a lump of ear wax on one side and not the other so the cold water hits one ear drum and not the other. But a rare cause is having a severe case of Swimmers Ear. The bony outgrowths in the ear canal called exostoses can get so bad as to make colder water enter one ear canal more slowly than the other. So if you have a case of cold water vertigo but you are not wearing a hood always get your ear canals checked by your Doctor. One of the harder to treat causes of vertigo with diving though, is an inner ear bend. Fortunately this is rare but you would have a clue to its origin as it can occur after a rapid ascent on a long bottom time especially if you have been diving on HeliOx. The vertigo unlike ABV would last a lot longer and be present back on shore or the dive boat and having started after the decompression stops. 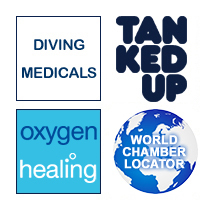 The only treatment for this is recompression at your nearest chamber, but if it happens some distance away, then do all the usual things for a case of decompression sickness. 100% O2, plenty of non-alcoholic fluids, then get to a chamber as soon as possible. But what can you do about the fear of heights or depths as it is underwater, so you don't end up pinned to a rock by an old DM called Jeff? Well, don't look down is a simplistic answer, but the devil on our shoulders always makes us do that. So my tip is to find a cleaner shrimp. This is not so stupid as it may sound, as you need to quickly focus on something in a level plane of vision to your depth, but just staring at a rock wont fix it. You need to engage the brain away from the thoughts of the abyss beneath you a little bit more. A cleaner shrimp is just easy enough to find but not that easy, and when you do find one they're interesting enough to keep you otherwise occupied for those crucial moments before you could completely lose it. Trust me.. it works.